I was shocked today to look at my calendar and find it was Friday. I mean, that’s a rarity. Normally I’m on full-out countdown mode for the weekends. I guess being stuck at home with “the plague” for the past day and a half did me in. For those of you who don’t know me – I have 2 irrational completely normal fears in life: needles and balloons. So a trip to the doctor’s office is always an anxiety-inducing experience, as I never know if they are going to have to jab me with something. “Oh no! Cause I’m gonna have to do it again” she said. Needless to say, between being sick and being tortured by Nurse McTeen, I was exhausted. I feel like I’ve been a waste of life this week – so I’m so thankful that I’m feeling a little better and have some of my energy back! So first order of business – share a yummy recipe with y’all! 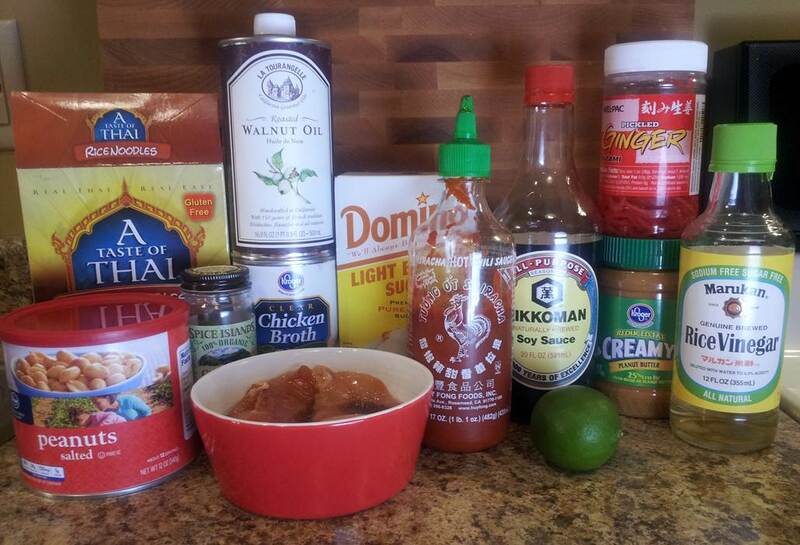 I mentioned previously that I’ve been on a “new” food kick, trying to venture out a little, and my husband reminded me of a recipe I haven’t made in a while that has a Thai-twist to it. Sorry to my readers with peanut allergies – this one is probably not up your alley! The ingredient list looks intimidating, but I assure you, it’s really simple to throw together and incredibly delicious. In a shallow dish, whisk together soy sauce, sugar, walnut oil and kosher salt. Add chicken breasts and marinate at least 2 hours. 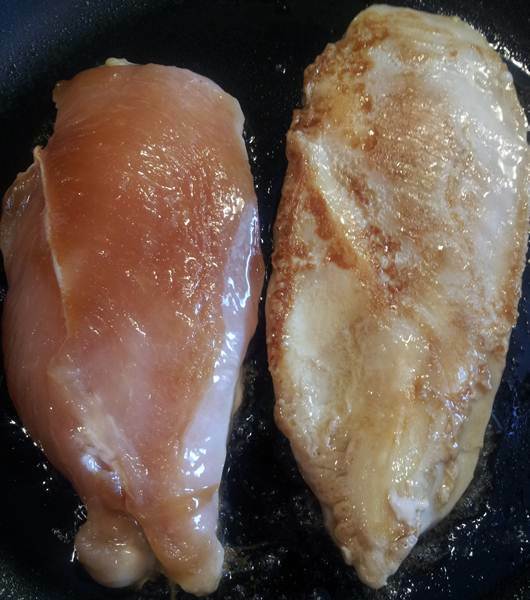 Remove chicken and cook through. I typically grill mine, but I just sautéed this time around and it was fine – about 4-5 minutes on each side over medium heat. Bring a medium pot of water to a boil and add rice noodles. Cook according to directions. While the noodles are cooking, heat chicken broth to medium heat in a small saucepan. Whisk in peanut butter, brown sugar, vinegar, lime juice, ginger, cilantro and Sriracha until smooth. Drain rice noodles and add peanut sauce. Stir to coat and add to plates. 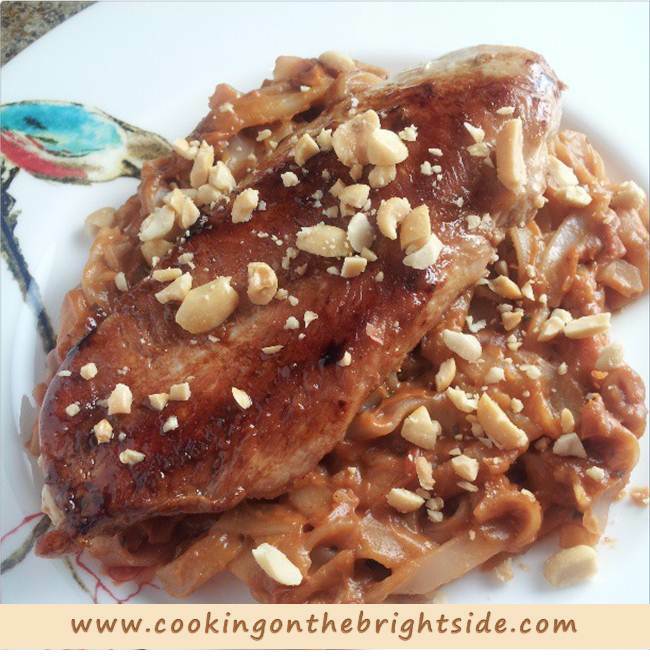 Top with cooked chicken breast and add chopped peanuts. 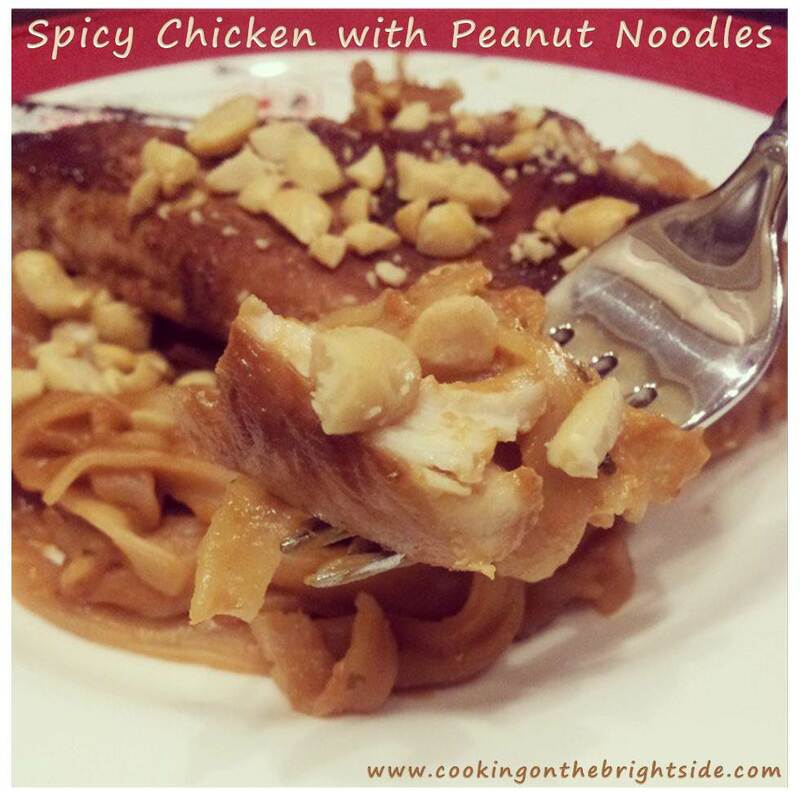 This entry was posted in Chicken, Main Courses and tagged peanut chicken, peanut noodles, rice noodles, thai chicken, weight watchers chicken, weight watchers thai recipe by cookingonthebrightside. Bookmark the permalink.